Are you ready for some competition? An Obstacle Course is an incredible way to keep things moving at your party or event! The inflatable obstacle course will provide some good old fashioned friendly competition as you race through the obstacle course! Everyone will have a blast racing through tunnels, up and over obstacles, through and around obstacles, and making a steep climb, and sliding down. This inflatable obstacle course rental is great for all ages, and is perfect for school fun days, street festivals and church group events. 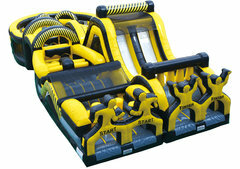 Bring your guests together with a bit of fun and friendly competition with our obstacle course rental.